Remember when I mentioned I found a Baja escape that I hoped to visit in the next few months? It happened! Sometimes you come across a place that is too good to pass up. Rancho Pescadero is one of those places. Where is it? In the most general sense: Mexico. Narrowed down: Cabo. Well, technically we are headed one hour’s drive north of Cabo, to the town of Todos Santos, a surfing and artist community. And even more specifically: 15 minutes south of town, about a mile and a half off the highway toward the ocean, a verdant valley at the end of a dusty, bumpy road lined with mango trees and vibrant produce farms. The postcards at the front desk read “outrageous oceanfront resort”, but this is a title more befitting their neighbors in Cabo than this desert oasis, where color palette and food palate reign supreme. Through the gates and down the light beige gravel driveway, we arrive at Rancho Pescadero’s open air lobby. The peach stucco and painted periwinkle walls immediately set the calm tone for our stay, complimented by contrasting black and white, small and larger floor tiles laid out in detailed design. Driftwood, delicately poised in oversized ceramic vases, writhes toward the clear sky. I’ll never tire of these ochre walls; in fact this is the exact hue I was trying to achieve when I repainted my deck - instead I ended up with more of a bright raspberry but I’m learning to live with it. Welcome cocktails with the house-infused jalapeño tequila are served upon arrival by a poolside bartender with all the right answers: What time does the pool close? It doesn’t. Can we take our glasses down to the beach? Claro que sí. In the sitting area to the right, built in benches are adorned with blue and white pillows of varying patterns, as are the matching ottomans (that glow at night!). We’re led through the grounds, past songbirds bathing in the water feature, past frangipani trees, bougainvillea, and desert rose (gangs all here! ), to our room in one of the freestanding haciendas. By the looks of the foyer, this could have been the proprietor’s original home. Wide, glazed terra cotta tile is framed by warm stucco and stone walls, leading to a marble staircase that winds just out of view. Carved wooden benches line the walls, accented with intricately designed leather pillows. To my great pleasure, we ascend the staircase to the third and highest floor—my request for an upstairs room granted. And behind our beautiful wooden door the terra cotta slips beneath, more treasures await. A patio with a 270-degree view from mountains to sea. A deep bathtub, bath salts invitingly perched on the ledge beneath wide open windows framing the terrain beyond. A soon-to-be-coveted bottle marked “Damiana Lotion” would reveal itself over the next three days to be a multiuse magical elixir of lavender, oils, and beeswax that worked wonders on my skin, served as shaving lotion, and also, when lightly applied, made my hair do all sorts of wonderful twists (and to my great pleasure, is also available for purchase at reception). There’s a beach wrap—or for those, like Jake, who know it and love it best as the Tahitian pareo—neatly hanging from a rack, and Jake calls dibs with one quick look. Our 6 p.m. arrival on Friday allowed just enough time to catch sunset on the beach, before strolling the stone pathway 50 yards to dinner, led by the melody of piano notes flowing from the garden restaurant. And when I say garden restaurant, I mean it: rows and rows of chard, herbs, and lettuce disappear into the night beyond the dancing light’s reach of a shoulder-height fire pit. We order a $25 bottle of Mexican Chenin Blanc (we’re told 90% of Mexico’s wine is produced in the Baja peninsula, which is one of the oldest wine regions in North America) and quickly become fans—and yes, you can order a bottle on ice to take back to the room. Everything is delicious, including the green chile, chorizo, and goat cheese wood-fired pizza (obviously). Saturday is our first full day and we don’t leave the premises - but that doesn’t mean we aren’t bouncing around. From the modern pool with loungers set in six inches of water (plus hot tub), to the lagoon-colored freeform pool (plus hot tub); from day beds in the dunes to sturdy cobalt blue Adirondack seats in the sand, there are options to make each moment feel like enough of a separate occasion. I felt like Goldilocks giddily familiarizing myself with my fortuitous plethora. We start with breakfast in the room, awakening to a tray of coffee and pastries outside the door. Yoga follows in the pavilion (complimentary daily at 10 a.m. - great instructor; I take breaks as I sweat my body weight and know tomorrow it will be easier, but also know I won’t be doing this again). Lunch by Pool #1: bar-side; a sharp-lined, tiled and bright pool with recessed loungers built into a submerged ledge. Shrimp tacos that I’ll order daily and am still dreaming about. Handcrafted cocktails at a mere $7 to Tulum’s $14, made with care while you slink back into the leather high chairs. I order a strawberry and basil drink from the menu, and am told though strawberries are not in season, the local passion fruit is in abundance. The bartender slices one in half for me to spoon out, taste, and decide. Yes, that’ll do. There’s also freshly (home)made grapefruit soda water on offer, infused with oregano, thyme, and mint. And, naturally, a green juice that finally speaks to me: their “Green and tonic.” You can imagine. Through the palm grove, up and over the dunes to the beach we walk. From the beautifully-crafted day beds’ vantage point, the water looks deceptively flat, but crest the shoreline and the steep beach reveals waves dive-bombing the sand, producing 15-foot whitewater explosions. I nap to the tune of the thunderous surf and awake to the pervasive beach mist casting a warm misty glow on all sights south to north. Did I mention Rancho Pescadero provides everything you could think of? Right. That includes fire pits on the beach, fresh bundles of firewood neatly stacked aside, which Jake successfully starts on the last match. We take advantage of this golden hour at the beach, just around 6 p.m., the sun still just high enough to cast its resplendent glow on the sea. The day wouldn't be complete without a dip in Pool 2: slightly quieter (with no people instead of four, and no music from the bar), so my imagination didn’t have to wander too far from reality to pretend we’d rented a whole villa. This is followed by another spectacular dinner in the garden, live pianist present, culminating in the best goddamn churros I’ll probably ever have, served piping hot with a side of homemade caramel sauce. Having spent a full 24-hours on site, the next day we’re ready to take a step out and explore the area – specifically, a more forgiving surf 10-minutes’ drive south of us at Cerritos Beach. And on our way out, because Rancho Pescadero is not through with impressing us, we are directed to the “shed” in the gravel lot: a beautiful twig-entwined structure made of horizontally woven branches in a local architectural style that houses beach chairs, umbrellas, surf boards, and even soft racks to complete your day trip. What a delight. After bobbing in the calmer water at Cerritos and putting an end to my surf hiatus with a few ankle-slappers, we drive into the town of Todos Santos. Though sleepy on a Sunday, we do wander into a couple of shops and leave with a hand-painted ceramic ornament, and richly dyed indigo-hued beach blanket. For dinner, we had overheard guests talking about the great al fresco meal they had at a restaurant called Yierba Buena. When I enquired as to its whereabouts, they point down the dirt road! Behind the same unassuming gates we’ve driven past a few times now lies another garden restaurant, Yierba Buena’s very own bounty of herbs and vegetables nearly arranged like a Hampton’s nursery before scattered tables and a platformed en plein air dining area. There’s a decent crowd, and Jake and I take seats at the open-kitchen bar, beside an arrangement of leafy greens casually brushing up against a watermelon. Jake consumes a simple grilled fish and vegetable plate so divine, so full of each bites’ natural flavor potential, he calls over the young, humble chef to congratulate him. The food’s been great this trip. With our activity level on a steady incline, on day three we’re compelled by the calm, clear blue waters of Ballandra Bay in the Sea of Cortez, and drive one-and-a-half hours to the eastern coast of the Baja Peninsula to check it out (but not before a dip in the pool while we awaited our hot breakfast – the burrito, typically an order of three, but thoughtfully upped to four so Jake and I could fairly share). I’d like to say the trip across the desert was worth it. Truth is, the bay wasn’t much more than two feet deep in most areas, and there was about one hundred more people than I had expected, which was zero. I actually got stung by a bee (when has that last happened to you?) while wading in the water to avoid getting stung by said bee. Aggressive. In some kind of unexplainable judgment lapse, we hadn’t packed drinks for the day and there’s nowhere at the beach to purchase. So Jake offers to drive the ten minutes back toward a restaurant we passed on the way in. While he’s gone, I’m eyeing the kayak stand we’re waiting for someone to return a two-person kayak to, and the road for sight of our white rental car. It’s taking a long time, and he doesn’t have his phone, and I’m worrying. Soon he glides into my peripheral vision, not by land but by sea, face beaming with pride as he rows in on a two-person kayak, 6-pack of local beer poised proudly on the nose. We paddle way out and spot marlins leaping out of the water in the distance. So, that was cool. We drive into La Paz to check it out, but the jolt of city living is too harsh for our vacation mellow. We do learn, though, that stop signs in La Paz are truly only a suggestion; basically, if no one is at the intersection as you approach, you continue onward with maybe a slightly reduced speed. When we made it back to the Ranch, I was all too glad to be returning to our little solitary slice of heaven. It’s hard to beat. By the time we awoke on our fourth morning there, we were relishing our morning routine of sipping coffee on the patio, checking the waves and scanning over the palm tree tops all the way to the mountain slopes, to the tune of our ever-present song birds, trying to soak in each last moment. It’s hard to beat, and it’s harder to leave! If there’s a flash sale on LAX-Cabo airfare, I know where I’m headed. 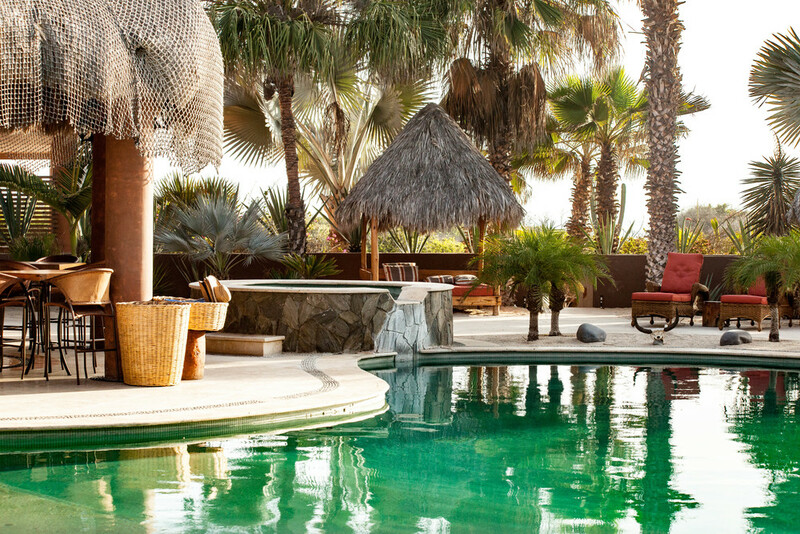 We would all benefit from a stay at Rancho Pescadero. Just book your babysitter now – no kids under 18 allowed! And hold on to the immigration form that’s detached upon arrival. Jake almost missed our flight having lost his - not that I would have minded one more night back at the ranch….